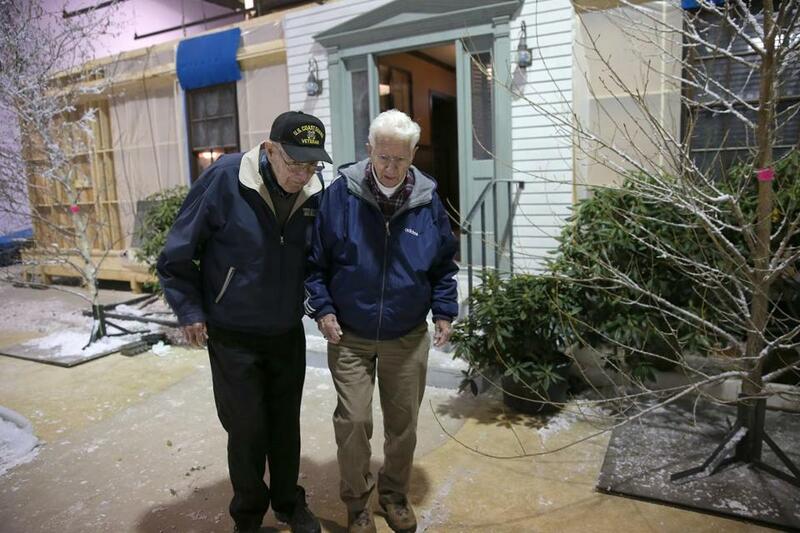 Andy Fitzgerald (right), with Mel Gouthro, visited the movie set in Quincy, where a film reenacting his heroics was shot. QUINCY — Nearly three dozen crewmen huddle against the cold rail of a massive stricken ship. Lashed by a howling nor’easter, one of them clambers down a 40-foot ladder to a small, pitching, overcrowded rescue boat. And that’s just on the movie set. The scene, filmed by Disney Studios in a cavernous building at the former Fore River Shipyard, is a re-creation of what the US Coast Guard calls the greatest rescue by a small boat in its history. As the frantic scene was shot, and then shot again Tuesday, 83-year-old Andy Fitzgerald sat riveted in a director’s chair and recalled the harrowing events of Feb. 18, 1952. The impossible seemed real again. Fitzgerald was one of four Coast Guardsmen who left Chatham in a 36-foot wooden boat, at night in a blizzard, and in the teeth of 60-foot waves, to rescue the crew of the SS Pendleton, an oil tanker that had broken in two off the elbow of Cape Cod. Doing the job that night resulted in the rescue of 32 crew members of the Pendleton in a Coast Guard boat designed to hold eight. Fitzgerald and his comrades had fought the brutal storm for five miles, without a compass or even a windshield, which had been destroyed by the waves. On the return trip, in zero visibility, they hoped they would find the beach. Although the night is seared in Fitzgerald’s memory, not many people are familiar with the story. Even Fitzgerald’s wife, Gloria, said she had not heard of the rescue until after she married Andy in 1956. That humility is a big part of the story’s appeal for Watertown resident Dorothy Aufiero, who is coproducing the film, called “The Finest Hours” and based on a book of the same name. The rescue earned the crew the Gold Lifesaving Medal, the Coast Guard’s highest honor. But Fitzgerald, who was raised in Whitinsville, Mass., and lives in Aurora, Colo., said he sees nothing unusual about the job he and his crewmates did. When asked why he has not discussed the mission more, even with his wife, Fitzgerald replied without a hint of glibness or irony. “She never asked me,” he said matter-of-factly. Fitzgerald and his wife were flown to Massachusetts this week to watch two days of filming at the old shipyard, where the hull of the Pendleton has been re-created in a mammoth indoor pool. “It’s just amazing,” said Gouthro, who lives in Wrentham. Coproducer Jim Whitaker, who also produced “Cinderella Man,” said he was attracted to the story partly because he spent his formative years on the Nova Scotia coast. Kyle Gallner, a 28-year-old actor who plays Fitzgerald, echoed that sentiment. After lunch during another 12-hour day on the set, Gallner posed for pictures with the Fitzgeralds. Before the photos, true to his unassuming nature, Fitzgerald told a visitor how much he admired the actors for working in cold, wet conditions on the indoor sound stage.